The Tipsy Baker: Who doesn't love a bundt cake? People, it is not hard to cook from Thai Street Food. It is hard to shop from Thai Street Food. There's not one dish in this book you can make using Safeway ingredients and over the last few days it's been impossible for me to get to the Asian market in San Francisco. I will get there soon, I promise. I want to be the first cookbook reviewer who actually cooks extensively (or at all) from David Thompson's beautiful book. Since I couldn't do Thai the other night, I decided to make a dinner from Dorie Greenspan's Around My French Table. I really admire Gabrielle Hamilton's writing, but when I first read her review of Greenspan's book on Food52 I thought she was perhaps overly harsh. Then I sat down to choose what to cook from the volume and I found myself curiously and completely uninspired. Almost every entree looked heavy and old-fashioned, stodgy and unappealing. Nothing tempted me except for the cola-and-apricot jam spareribs, but they required long cooking and I didn't have a long time. In the end, I only used Greenpan's book to make dessert, which was Marie Helene's apple cake. I chose the cake because Gabrielle Hamilton approved, as did David Lebovitz. Also: easy. My family hardly touched it, deemed it too plain. At first I agreed, but when I had a piece the next day, I changed my mind. This is a cake that improves with age. It's very moist and rummy, almost like a pudding or clafoutis, almost refreshing. I just now had another delicious wedge for lunch dessert, two words I should probably never use together again. You can find the recipe for this excellent cake here. I'm going to subject Dorie Greenspan's book to further scrutiny in the future. On the subject of cakes, we are celebrating Isabel's fourteenth birthday tomorrow. Last night I asked, "What kind of cake do you want?" She sighed and replied, "Oh, I don't really care. You pick." Then she disappeared to her bedroom. A few minutes later she came running down the stairs with a wild look in her eye, pointing a finger at me accusingly. "NO BUNDT CAKE," she said. "You always run out of time and end up making a bundt cake. I do NOT want a bundt cake." I knew the teenage diffidence was just an act! Then she casually pointed out a cake she wouldn't mind having. It consists of angel food and devil's food cake layers sandwiched with peanut butter mousse and frosted with chocolate ganache. It makes me tired just to look at it. Here are some more pictures of said cake. Of course, she was absolutely right. I was going to think about it and think about it and eventually just make a bundt cake. You can't make a bundt cake for someone's birthday! That's for church potlucks or some such thing. Hahahahahehehehehohoho! That's funny, and of course she has to go and pick THE most time consuming cake on the planet! I just got Dorie's cookbook too and am having a delightful time perusing it. I always liked a bundt cake, even for my birthday, especially the kind from the box that had the "tunnel" of pudding or whatever it was in the middle. 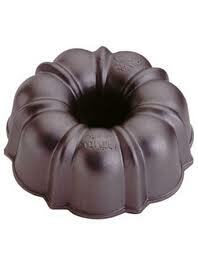 I just bought a bundt pan (why didn't I have one before? that's crazy!) so I can make the Root Beer Bundt Cake from the original Baked cookbook. Only problem is I'm the only one in my family who wants to eat a root beer cake, so I have to wait till we have some guinea pigs ... er, guests. I'm with Anonymous 7:01--my mom used to get the Boston Cream Pie mix. And once my aunt made a macaroon one with coconut pudding in the center. My Grandmother's Harvey Wallbanger cake always came in the form of a bundt and was always delicious. Looking back I'm not sure it was entirely child-birthday appropriate. The cake seems aptly named "Heaven and Hell." Heaven to eat and Hell to make. 1) The ganache was really a bit too much for my family--we could have used a light glaze, at most. 3) While my 4 cakes cooked simultaneously, I made the peanut butter mousse, then threw it in the fridge to chill. 4) When the cakes were done, I cooled them. At assembly time, there was no cake cutting--just stack, mousse, stack, mousse, etc. The cake was a big hit, but was large enough to serve dozens of people. It was also so tall it didn't really fit in a regular refrigerator (unless you move all your milk to the door or sideways on lower shelves). Verdict: It doesn't have to be hard to make, but it makes way too much for most folks and is impossible to store without a commercial fridge. Anonymous 3:00 -- I had a similar experience. The cake was HUGE and kind of ridiculous. Good, but ridiculous.